Murray is 17 miles West of Kentucky Lake. It has a population of 17,000 and is the home of Murray State University, which makes it the cultural center of The Purchase (the region of Kentucky between Kentucky Lake and the Mississippi River, which was purchased by Andrew Jackson from the Chickasaw Indians). 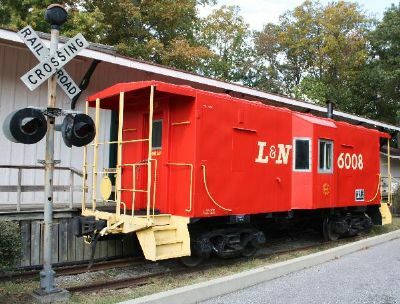 Murray has a fine museum which depicts the history of that area from the time of the Chickasaw to the present, one of the state's greatest art galleries with over two thousand works on display, and the Playhouse In The Park, which is adjacent to the iconic L & N Caboose shown above left. During your stay at Kentucky Lake, a rainy day might profitably be spent touring the Murray State campus, the gallery, and the museum, then taking in one of the plays in the Summer Season. 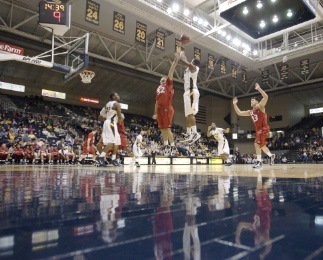 If you're down during the Winter, you could take in a Racer game (above right). The Racers are frequent NCAA qualifiers and have pulled spectacular upsets. 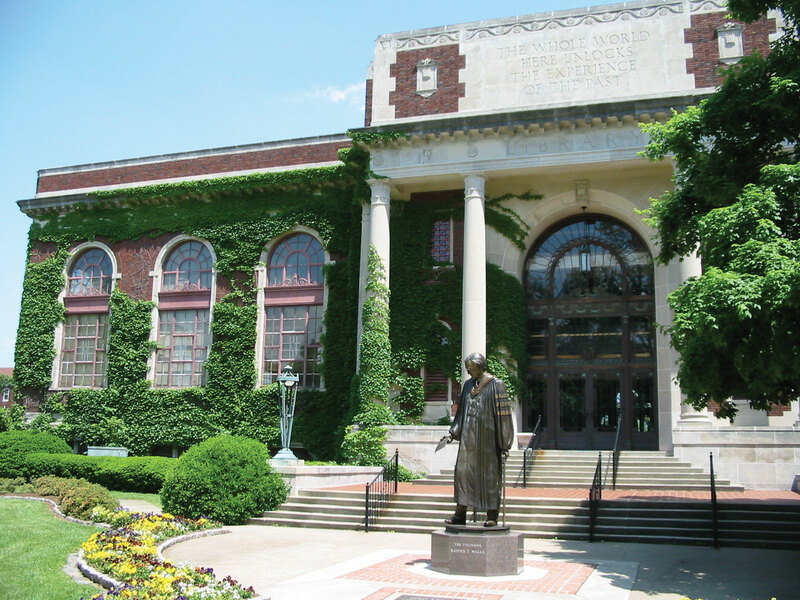 Shown here at right is the Pogue Library. You might also visit the Hancock Fisheries and Aquatic Ecology Camp on the lakeshore. Murray has one of the nation's top Fisheries and Aquatic Biology programs. Like any college town, Murray boasts several good restaurants which would be competitive in Lexington, Louisville or any other major city. 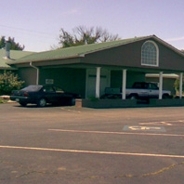 The best place to start in Murray is J. Edwards Seafood & Steak. Of the many intriguing Appetizers, we particularly like the Swordfish Skewers, Sausage Onion Pepper Medley (sauteed in a garlic wine sauce), and Crawfish Shrimp Fondue. Their Soup of the Day is always good, and of the Salads we recommend their Tomato Red Onion (in a balsamic vinaigrette and crumbled bleu cheese). Their Entree menu leads off with eight steaks, which they consider one of their signature items. They broil each steak at 1200 degrees, then serve them on 450 degree platters in a pool of butter. We do like their steaks, but we'd like them a lot better if instead of using feedlot cornfed cattle they used free ranging grassfed. With their skill in preparation, this much better quality of beef would catapult J. Edwards into the ranks of the very best steakhouses in the country instead of just one of the very best in Kentucky. However, if you're not into steaks, they offer four Veals and four Chops, all excellent. There are five Chicken entrees and 12 Pastas, of which our favorites are their Portabello Ravioli and Heavenly Bowties (bowtie pasta with shrimp, asparagus and tomatoes in brandy cream sauce). And we are not usually bowtie pasta fans. We have to admit to being disappointed in their Seafood page. They are very good at preparing seafood, and we would love to taste their versions of Catfish, Trout or Walleye. Alas. They offer no freshwater entrees. But what they do offer are some of the best seafood dishes in the state. Their Grouper is the star of the show, but the Salmon, Swordfish and Mahi Mahi are excellent. If you want Alaskan King Crab Legs, Shrimp or Lobster they offer it at daily market prices. Their desserts change each day but are all worth ordering. They have one of the state's finest wine cellars (mostly American, Italian, Spanish and French) and the menu lists the recommended wine with each entree. Our second recommendation in Murray is the Garden Gate, just outside town on Route 94 (meaning it's closest to KenLake Resort). This quaint little place is known for its Quiche and Creamy Tomato Soup, but has lots of other delightful items on the menu. Gloria's World is Murray's Middle Eastern restaurant. 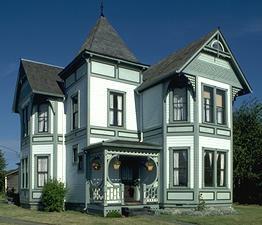 It's in a restored 1800s house which itself is worth a visit. Locals go there for the Curry, for the Lamb Gyro with balsamic rice, and to buy ethnic items for home cooking at the sideroom grocery, but we think their Mediterranean Vegetarian Platter (it includes an excellent falafel) and the Panang Beef Curry are their best entrees. Gloria's husband Stu makes a Stu's Stew on special occasions and if you're there on one of those occasions you MUST order some. The Barbeque Pork Croissant is excellent if you just want a sandwich. All the MSU kids rave about their Gyros, but the secret is in the yogurt sauce. Someone at your table has to order the Chai Tea and share. Dinh's Vietnamese Cuisine is the former Dinh's Eggrolls. As the name implies, Ho Dinh built a business out of serving eggrolls to his mostly college student clientele. But there's more here than eggrolls. First you have to have some tea. Dinh serves exotic milk and fruit teas, called "Bubble Teas." You can get every imaginable flavor of tea : yogurt, kiwi, blueberry, green apple, watermelon, cantaloupe, banana, passion fruit, chocolate and the list goes on and on for a whole page. Then you have to have some Soup : Egg Drop, Won Ton, Hu Tieu Nam (rice noodles with bean sprouts, fish cake, sliced pork, shrimp, squid and quail eggs), Mi Ho Phuc Kien (egg noodles, pork, shrimp, onions), Pho Tai Gan (rice noodles with meat balls), etc. Dinh offers 15 soups in all. Once you get past the teas and soups, there are Appetizers. We love his Crab Rangoon (wonton shells filled with crabmeat and creame cheese). And finally there's a page of Entrees, such as the Vietnamese Omelette (includes ground pork), a Vegetable Shrimp Chicken Medley, and Spicy Shrimp & Pork. We like his Chicken Rague, Korean Beef and Chicken Curry (Vietnamese stewed chicken, onion, potatoes, carrots, coconut curry sauce and rice). You can even get Sushi, like the Spicy Crab Roll.